Ethiopia’s Tiki Gelana held off the Kenyan Priscah Jeptoo to win gold in a soggy Olympic women’s marathon on Sunday. Gelana clocked 2hr 23min 7sec, an Olympic record time, finishing five seconds ahead of Jeptoo. The Russian Tatyana Petrova Arkhipova won bronze with the pre-race favourite Mary Keitany having to settle for fourth. It was Gelana’s major championship. Mara Yamauchi’s Olympic marathon lasted less than 10 kilometres on the rainy streets of London. A week after Paula Radcliffe withdrew from London 2012 with a foot problem, an injured Yamauchi stopped in tears on the side of the road around 9.4km into the race as she decided she could go no further. The 38-year-old Oxford athlete had been hampered by a bruised heel in the buildup to the Games and, although determined to get to the start line, was clearly not fit. The prerace favorite, Mary Keitany of Kenya, who won the London Marathon in April, could not hold the pace at the end and finished fourth in 2:23:56. Surprisingly, a Kenyan woman still has not won an Olympic marathon since the event was first held in 1984. 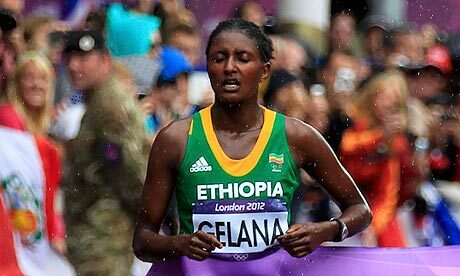 Gelana, 24, had won the Rotterdam Marathon earlier this year in 2:18:58, an Ethiopian record. On Sunday, she bested the Olympic record of 2:23:14, set by Naoko Takahashi of Japan at the 2000 Sydney Games. Gelana ran the first half Sunday in 1:13:13 and the second half in 1:09:54. It was a frustrating day for the three American entrants. Shalane Flanagan and Kara Goucher went to the lead early but faded. Flanagan finished 10th in 2:25:51, while Goucher was 11th in 2:26:07. Desiree Davila, who had been battling a hip injury, dropped out after 2.2 miles. Sunday’s 26.2 mile race was run on a course with one loop of 2.2 miles and three loops of eight miles. A heavy downpour dropped the temperature to 57 degrees, a nearly ideal temperature, but steady rain continued as the race began. The water began to puddle in places, and the runners splashed as they struck the ground. Flanagan and Goucher went to the front early as the race began slowly with opening miles of 5:23 and 5:53 on the sinuous course. Keitany tucked in behind them, having learned her lesson about reckless running last fall at the New York City Marathon, when she went out at world-record pace only to fade to third. At 5 kilometers, or 3.1 miles, Flanagan and Goucher also remained at the front of a large pack of runners with a time of 17:20. They held their position at 10 kilometers, reaching the 6.2-mile mark in 34:46, with Valeria Straneo of Italy and Zhu Xiaolin of China, the fourth-place finisher at the 2008 Beijing Games, also at the head of the pack. At 15 kilometers, or 9.3 miles, Yoshimi Ozaki of Japan took her turn at the front as the lead pack arrived in 52:10 with the race on a metronomic 2:26 pace. The downpour slowed to a drizzle, the flags hanging slack along the course with little or no wind. The lead pack reached the halfway point in 1:13:13, with 23 runners within three seconds of the lead. A major casualty came soon after as one of the favorites, Liliya Shobukhova of Russia, dropped out. Her victory at the 2011 Chicago Marathon in 2:18:20 made her the second-fastest woman ever behind Paula Radcliffe of Britain (2:15:25). But Shobukhova missed a couple of spring races in the United States because of a hamstring injury. And perhaps she never recovered. Radcliffe did not enter the Olympic marathon, the strain of competition through the years having left her feet brittle and unable to replicate her greatest performances. As could be expected, Keitany and her Kenyan teammates moved to the front for the second half of the race. Keitany is the world half-marathon record holder in 65:50. She won the London Marathon in April in 2:18:37. At her best, no one would be able to outrun her. But she was not at her best Sunday. Just beyond 25 kilometers, or 15 miles, the lead pack had winnowed itself to six runners — Keitany, Edna Kiplagat and Jeptoo from Kenya and Gelana, Aselefech Mergia and Mare Dibaba from Ethiopia. Flanagan was in seventh place, four seconds back. Goucher was in 12th place, six seconds back. But Flanagan and Zhu from China regained contact, if only briefly. At 26 kilometers, one of the leaders, perhaps Keitany, stepped on water and stumbled momentarily before regaining her stride. The sun now peeked out. At 30 kilometers, or 18.6 miles, the quickening race seemed — incorrectly — to have whittled itself to the three Kenyans and Gelana and Dibaba from Ethiopia to decide among the medals. Flanagan had dropped 11 seconds off the pace into seventh place. Goucher was 30 seconds back in 12th place. At 32 kilometers, Dibaba had dropped back. The lead pack was now four. But Petrova Arkhipova of Russia had been stalking the East Africans. She had been in 10th place at 25 kilometers and sixth place, nine seconds back, at 30 kilometers. Now she seemed to come out of nowhere to catch the leaders. As if running a 1,500-race, she moved up to third as Kiplagat, the 2011 world marathon champion, dropped to fourth. Kiplagat, though, rejoined the lead pack, which expanded to five — three Kenyans, an Ethiopian and a Russian. As the race neared two hours, Kiplagat again dropped back. By 35 kilometers, or 21.7 miles, Petrova Arkhipova had moved into a thin lead in 1:59:29. The race was down to herself, Keitany and Jeptoo of Kenya and Gelana of Ethiopia. It remained that way through 40 kilometers or 24.8 miles, in 2:16:20. Petrova Arkhipova dropped back twice, only to recover and yo-yo herself among the leaders. A half-mile later, Keitany surprisingly fell off the pace. Jeptoo, her teammate, had brought her water minutes earlier, but Keitany now appeared drained. Petrova Arkhipova also fell away a third time, losing her form. In the 25th mile, Gelana surged, opening a gap on Jeptoo as the rain began again. Ethiopia had won another distance running gold medal.